Today, the Pilgrim Tercentenary Commemorative Silver Half Dollar Coin remembers when the Captain and remaining crew in the Mayflower left Plymouth harbor on April 5, 1621 sailing for England. Mar. 23. At anchor. A fair day. Some of the ship’s company went on shore. Some of the Indians came again, and Captain Standish and Master Allerton went to see the king, and were welcomed by him. This morning the Indians stayed till ten or eleven of the clock, and the Governor, sending for the king’s kettle, filled it with pease, and they went their way. Making ready for sea, getting ballast, wood, and water from the shore, etc. The Planters held a meeting and concluded both of military orders and some laws, and chose as Governor, for the coming year, Master John Carver, who was “governor” on the ship. Mar. 24. At anchorage. The ship’s company busy with preparations for the return voyage, bringing ballast, wood, and water from the shore, etc., the ship having no lading for the return. This day died, on shore, Mistress Elizabeth Winslow, wife of Master Winslow. Many still sick. More on the ship than on shore. Mar. 25. At anchor in Plymouth harbor. The fifteenth Sunday in this port. Many of the crew dead and some still sick, but the sickness and mortality lessening. Mar. 26. At anchor. Bringing ballast from shore and getting ship in trim. Mar. 27. At anchorage. Getting ballast, overhauling rigging, getting wood, water, etc., from shore. Mar. 28. At anchorage. Same. Mar. 29. At anchorage. The Master offered to take back any of the colonists who wished to return to England, but none desired to go. Getting in stores and ballast. Mar. 30. At anchorage. Hastening all preparations for sailing. Getting ballast, etc. Water butts filled. Apr. 1. At anchor in Plymouth harbor. The sixteenth Sunday the ship has lain at anchor here, and to be the last, being nearly ready to sail. Most of the crew ashore on liberty. In the sixteen weeks the ship has lain here, half of her crew (but none of her officers) have died, and a few are still weak. Among the petty officers who have died have been the master gunner, boatswain, and three quartermasters, beside the cook, and more than a third of the sailors. A bad voyage for the owner, Adventurers, ship, and crew. Apr. 2. Still at anchor, but making last preparations for voyage. Ship’s officers made farewells on shore. Governor Carver copied out, and Giles Heale and Chris. Jones witnessed, Master Mullens’s will, to go to England. Apr. 3. Still at anchorage, but (near) ready to sail with a fair wind. Master Williamson, the ship’s merchant [purser], appointed by Master Mullens an overseer of his will, takes copy of same to England for probate, with many letters, keepsakes, etc., etc., to Adventurers and friends. Very little lading, chiefly skins and roots. Make adieus to Governor Carver and company. Apr. 4. Still at anchor in Plymouth harbor. Sails loosened and all ready for departure except Governor’s letters. Last visits of shore people to ship. Sail with morning tide, if wind serves. One hundred and ten days in this harbor. Apr. 5. Got anchors, and with fair wind got under way at full tide. * Many to bid adieu. Set colors and gave Planters a parting salute with the ensign and ordnance. ** Cleared the harbor without hindrance, and laid general course E. S. E. for England with a fine wind. Took departure from Cape Cod early in the day, shook off the land and got ship to rights before night. All sails set and the ship logging her best. And so the May-Flower began her speedy, uneventful, homeward run, of but thirty- one days, arriving in England May 6, 1621, having been absent, on her “round voyage,” from her sailing port, two hundred and ninety-six days. * All vessels departing from Plymouth harbor leave when possible on the full or slack tide, or the early run of the ebb. No mention is made of the shallop accompanying the ship out of the harbor, as she did on some other occasions. Jones had familiarized himself, doubtless, on his fishing and hunting trips, with the channel, and needed no pilot out. ** Always the custom in that day, in this case certain to be observed. Captain Standish’s guns no doubt boomed their reply, surrounded by strongly moved but sternly quiet men and women, who climbed “the Hill” to watch the departure. Goodwin says truly, “The return of the May-Flower must have been a painful sight to the Pilgrims. She had been an ever-ready shelter in case of disaster, and was a connecting link between them and the rest of their race. 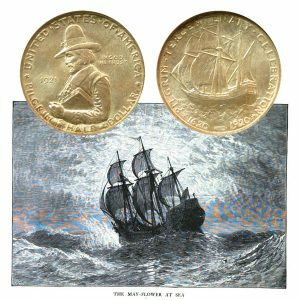 The Pilgrim Tercentenary Commemorative Silver Half Dollar Coin shows with an artist’s image of the Mayflower sailing on the open ocean.